Cherry juice is considered extremely useful for the purpose of skin lightening and clearing dark spots. Due to its anti-inflammatory properties, it treats acne and rosacea, too. In addition, cherries moisturize the skin and soothe damaged skin. This delicious fruit has various skin and health benefits as it is loaded with in vitamin A, vitamin C, potassium, zinc, iron, copper, manganese, etc. Plus, being rich in antioxidants, cherries also help fight against signs of ageing as they protect the skin from damage by free radicals. Besides, eating cherries relieves problems like migraine headache and insomnia. Regular consumption of this fruit helps maintain healthy heart and prevents memory loss due to oxidative damage to neurons. • Simply applying mashed cherries (remove the pits) on your face on a regular basis can make your skin soft, smooth, and firm. You can mash up the cherries with the help of a fork. Make sure you wash and clean your face before spreading the fruit on your skin. If you have an oily skin, prefer to use sour cherries. • Prepare an easy cherry face mask by mixing one teaspoon of organic honey and a few drops of lemon juice in a few mashed cherries. Apply this paste on your face and neck and wash it off with lukewarm water after 15-20 minutes. Use this home remedy regularly to cure acne and rosacea. 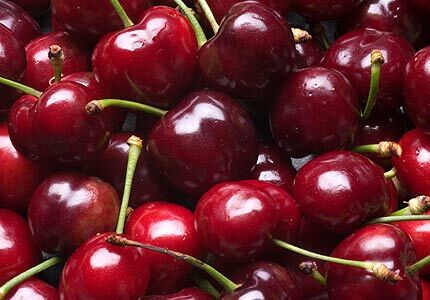 • Applying a combination of a handful of cherries and two tablespoons of organic honey on skin for 20 minutes and then washing it off with warm water is highly beneficial for fading wrinkles and fine lines naturally. It helps remove dark spots as well. • Take five cherries and three strawberries. Mash both the fruits thoroughly and smear the resultant paste on your face and neck for about five minutes to maintain younger looking skin. You may include rose water, too, to enhance the beauty benefits. • Crush a handful of cherries with a folk and add two to three tablespoons of plain yogurt in it. Apply this paste on your skin for 20-30 minutes and then remove it. This recipe is excellent for rejuvenating dull skin. Moreover, it makes your skin glow. You can also add coarse sugar in it and use the mixture as a facial scrub for exfoliation. • You can prepare another exfoliating cherry face mask by mixing one tablespoon of instant oatmeal with two tablespoon of cherry juice. Leave it on your skin for five minutes and then rinse it off to remove dead skin cells. • Take the pulp of eight or nine cherries and one ripe peach. Blend these ingredients in a blender or food processor. Finally, apply this paste on your skin for about 20 minutes to reduce wrinkles. This mask is particularly good for dry skin. You may add a teaspoon of extra-virgin olive oil in this recipe to make it more nourishing. • Make a beauty care recipe for oily skin by beating an egg white and mixing two tablespoons of cornmeal, one tablespoon of honey, and about ten mashed cherries in it. Apply this mixture on your face and neck. Finally, rinse it off with lukewarm water after 20 minutes.